Soweto, an acronym for “South Western Townships,” is a grouping of townships scattered across twenty kilometers southwest of Johannesburg, South Africa. 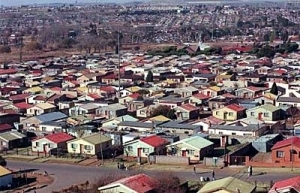 A quintessential example of segregationist planning, Soweto initially was the result of mass evictions and evacuations of black residents of the city of Brickfields by the British colonial authorities in the first years of the 20th Century. Though initially serving as an evacuation camp, Soweto was later designated to house black laborers who worked in British-operated mines and industrial sites away from the city center. From 1904 onwards, black South Africans were systematically relocated to Soweto to make room for incoming white settlers under a system of government-mandated segregation. Then, following the general election of 1948 which established apartheid as the centerpiece of racial policy, the South African government began officially classifying people into distinct groups (black, white, colored, Indian), and precipitously ramped up the forcible relocation of people to residential areas matching their group. Also at this time the South African regime dramatically reduced the commensurate appropriation of funds for infrastructure to non-white areas. Soweto grew rapidly in World War II from 244,000 in 1939 to 395,231 people by 1945. This unparalleled growth rate was primarily due to the loosening of constraints on black South Africans in the employment sector, as most white men were engaged in overseas military activities. Yet as white South Africans returned following the allied victory in World War II, employment opportunities for black South Africans declined. As a result black protests were common, as the 1945 Pan-African Congress and other anti-colonial movements rallied in support around places like Soweto. On June 16, 1976, massive student protest began in Soweto against official policy that for the first time mandated Afrikaans as opposed to English instruction in schools. A brutal police crackdown against protesters followed. This Soweto Uprising which claimed the lives of 566 residents also brought the world’s attention the reality of life under the apartheid regime. International sanctions followed, and in 1977 many employment restrictions against black people were loosened. Increasingly conscious of their plight, black South Africans began to openly protest apartheid in the 1980s through boycotts, strikes, street committees, and civic organizations. Particularly prominent was Soweto’s Committee of Ten, which began in 1978 in the offices of the The Bantu World newspaper. Operating covertly due to governmental restrictions which forbade public gatherings, the Committee of Ten used church buildings and other clandestine locations to organize their activities in secret. Though apartheid ended in 1994, its legacy has left Soweto as Africa’s most impoverished city. At the time of the student uprising in 1976, only 83% of houses had electricity, and 93% lacked running water. To this day roads remain unpaved, and many areas are still without electricity. Home to 3,500,000 people, Soweto remains the most populous black urban area of South Africa. Its people continue to reel from the consequences of decades of discrimination and neglect.